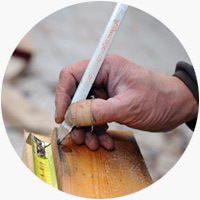 The majority of the time we can repair the sill by removing all the rotten timber and using our two-part epoxy resin wood repair system to fill any holes and imperfections. The sill is then sanded down to the original profile and primed. 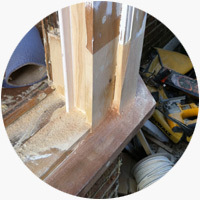 If the sill is in such a poor condition that we feel it would not produce a quality end result we would replace the rotten sill with a new hardwood (sapele) sill. We remove lower sections of the box frame and the old sill is removed. We then introduce a new hardwood (sapele) sill to match the profile of the original and recess it into the cavity. New sections of the lower box frame are morticed and fixed into the new sill and finally the new sill and lower box are sanded, sealed and primed. As part of our overhaul and service, we can re-glaze any cracked, broken or damaged panes of glass. In addition, we offer a comprehensive range of options including toughened safety glass, laminated security glass, acoustic noise reducing glass, traditional etched glass, recycled period glass, leaded lights and modern double glazed gas-filled units. 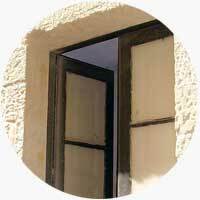 We manufacture our replacement double glazed windows to replicate the existing details. If either top or bottom sashes are rotten and beyond repair, we can manufacture and install new replacement sashes to match the original and we work to a tolerance of 1mm-2mm.We can also replicate any other timber mouldings or original sections as required. We also offer doubled glazed options if required. We predominantly work on sliding sash windows but our unique hidden brush pile system and overhaul service will achieve similar benefits in timber casement windows and exterior doors. Although we do not directly involve ourselves in the redecoration process, we can usually recommend a reputable decorator if required.